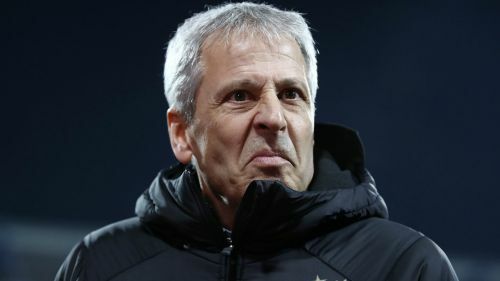 Lucien Favre is not worried about Borussia Dortmund's five-match winless streak following the Bundesliga leaders' goalless draw at lowly Nurnberg. Dortmund saw their lead atop the Bundesliga summit reduced to just three points ahead of defending champions Bayern Munich after Monday's stalemate against bottom side Nurnberg. Favre's Dortmund have not won a match in all competitions since January 26 following Bundesliga draws against Eintracht Frankfurt and Hoffenheim, while they lost to Tottenham in the Champions League and on penalties against Werder Bremen in the DFB-Pokal. Despite Dortmund's form, head coach Favre has no concerns, telling reporters: "Being worried? I will never do that. "Why? This is part of the game. You have to analyse these games. It's because of small details in almost every game. We were drawing in Frankfurt, Bayern [Munich] lost at the same time and everything was great. "And after that we drew 3-3 against [Werder] Bremen at home, then we drew 3-3 against Hoffenheim, we could have led 4-0 in this game. But that's part of the game. Luckily for the spectators, but not for us. "We are dissatisfied because it was the same in the Champions League. There was only 10 minutes to go and we were one goal down. We were dominating the game [on Monday], only a little bit was missing. We kept trying and we haven't had so much ball possession this season than today. "We also have to remind ourselves that we were also playing 0-0 on the second game of the season in Hannover." 0:0 – Borussia beißt sich am FCN-Bollwerk die Zähne aus. Bayern Munich v Borussia Dortmund: Who will win the Bundesliga?